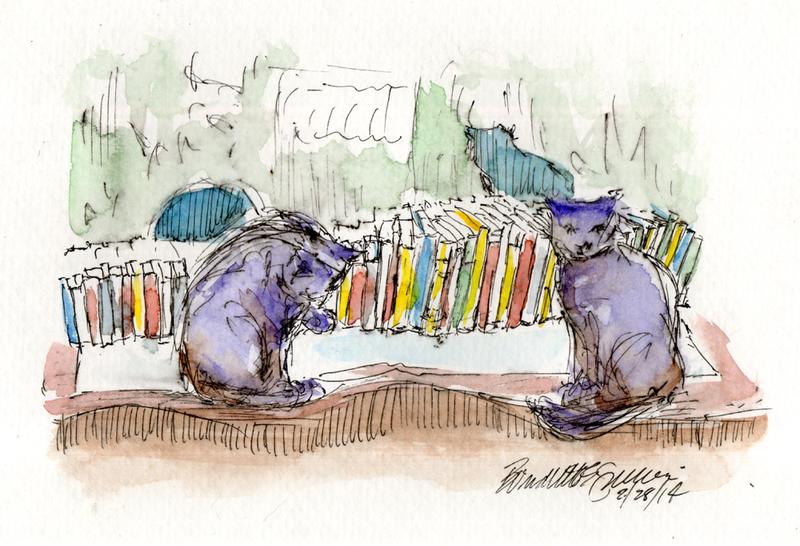 Evening in the Cat Book Library, Ink and Watercolor prints are made in archival inks on Epson Velvet Art Paper, Cold Press Digital Giclee Paper or Artist Canvas. Bean washes his face while Giuseppe surveys the room, sitting in the cat book library. In my office downstairs I have the triple dresser I’d mentioned in our last family portrait that holds my collection of cat books. It’s a favorite place to hang out, good view, and a cat can even see out the windows from there. It may be a little confusing in the background, but there is a mirror behind the books. I enjoyed watching the boys pass the time in feline ways, looking at each other, looking around the room, and having little baths, since it was after dinner. 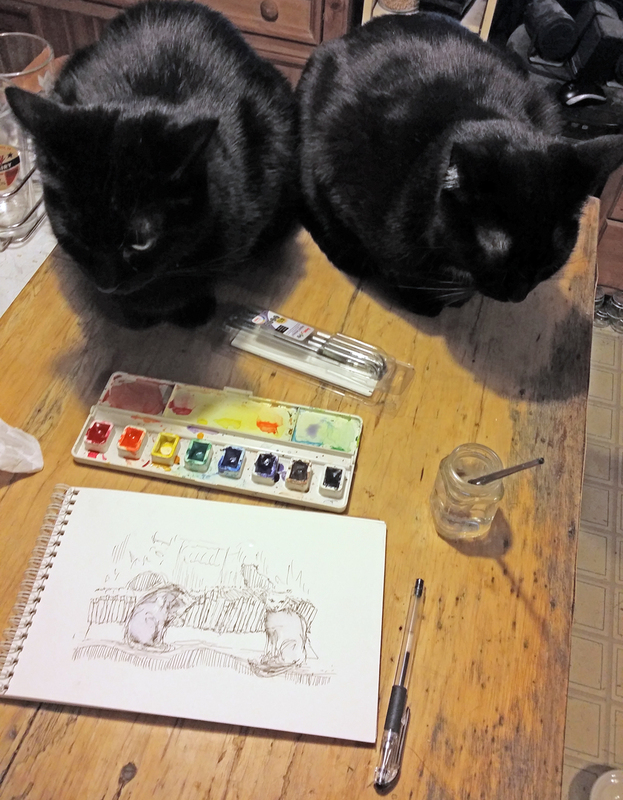 As usual, when they are active, I sketched Bean first on the left as he washed his face, then Giuseppe as he looked out into the room. they were actually mirroring each other for much of this activity but that looks funnier in the photos which I’ll share one day soon—synchronized feline relaxation techniques. It surprised me how many of the books had yellow spines, more than are here. I had forgotten with these pens that the ink is only water proof only after I let the sketch dry completely, at least 20 minutes. I started painting purple into the boys then actually blotted it off, but was even a little too soon with some of the other colors. It turned out okay though. Mostly because I was very carefully supervised. This entry was posted on September 1, 2018 by Bernadette.